Mont Saint-Michel is a rocky tidal island located in Normandy, at the mouth of the Couesnon River, near the city of Avranches. The highest point of the island is the spire at the top of the Abbey’s bell tower, 170 metres above sea level. They are currently less than 50 people living on the island. 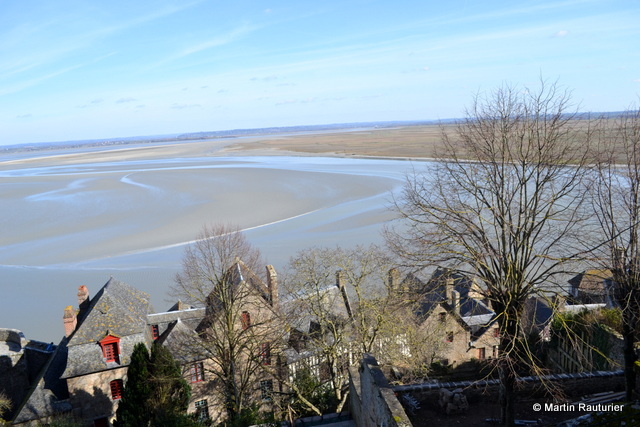 The unique feature of Mont Saint-Michel is that it is completely surrounded by water and can only be accessed at low tide. Victor Hugo described the tides as changing “à la vitesse d’un cheval au galop” (“as swiftly as a galloping horse”). Mont Saint-Michel is one of the most famous French monuments. Approximately 3 million people visit the site each year (3,250,000 in 2006). The Mount and its bay are listed as a World Heritage Site by UNESCO. Click here to get your ticket to the Abbey of Mont-Saint-Michel! First of all, imagine Mont Saint-Michel before any manmade structures: an 80 metres high rocky island made of granite, dominating the entire area at sea level. Early in its history Mont Saint-Michel was actually called Mont-Tombe which, according to different etymologists, implies either the idea of a graveyard (“tombe” or “tumba” in latin meaning grave) or a tautology “mount hillock” (“tombe” also refers to a word prior to the latin language : “tum”, meaning a raised place). However, the real history of Mont Saint-Michel starts in the 8th century, in 708 to be precise, when, according to legend, Archangel Michael (Mîkhā’ēl in Hebrew, meaning “who is like God”), leader of God’s armies against Satan, appeared to Aubert, bishop of Avranches. He instructed the bishop to build a church in the Archangel’s honour. Aubert repeatedly ignored the Archangel’s request until Saint Michael burnt a hole in the bishop’s skull with his finger. Also, it has been said that several miracles finally convinced Aubert and on 16 October 709, a church was built and devoted to Archangel Michael. 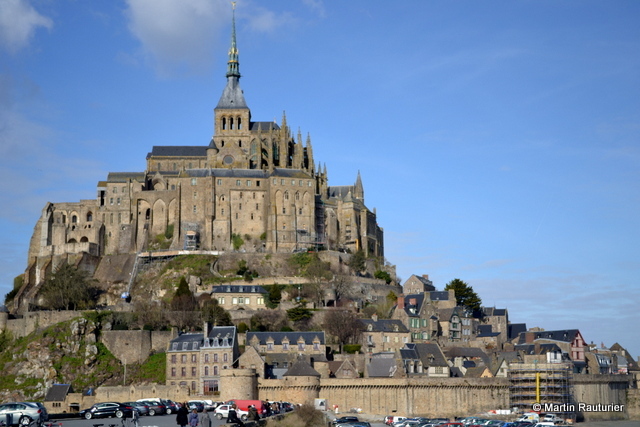 The mountain has been known since that time as Mont Saint-Michel (Saint Michael Mount). The Mount, located at the mouth of the Couesnon River, is nowadays part of the Normandy region but this was previously a matter of dispute as the Couesnon River marks the border between Normandy and Brittany, two power Duchies during the early Middle-Age. Between 867 and 933 Mont Saint-Michel belonged to the Duke of Brittany after the King of the Franks was unable to defend it against Viking invasion. 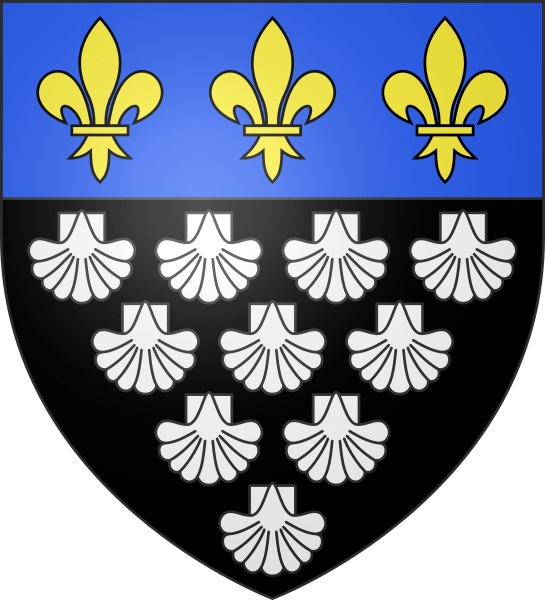 However, in 933, the new powerful Duchy of Normandy annexed the Mount following a victory over Connan II, Duke of Brittany. 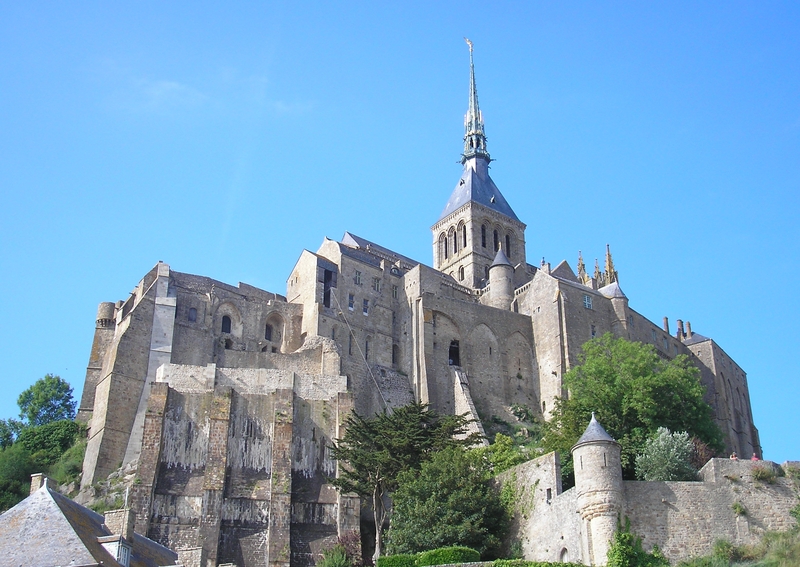 Later, in 966, a group of monks, sent by Richard, Duke of Normandy, established a Benedictine community on Mont Saint-Michel and started the important activity of collecting and copying books before printing was invented. 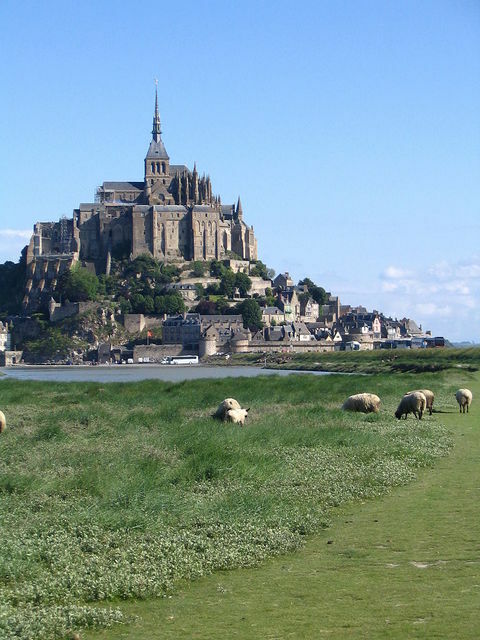 Under the protection and patronage of the Duchy of Normandy, Mont Saint-Michel gained many lands around the bay, even though the monks themselves remained poor. This wealth was used to develop the mount. It was an Italian architect, William de Volpiano, who was chosen by Richard II of Normandy to build the Abbey. He designed the Romanesque church of the abbey, placing the transept at the top of the mount. Many underground crypts and chapels had to be built to compensate for this weight. The Romanesque abbey was finished in 1084 and convent buildings were added and extended through the 11th and 12th centuries. The feature of this work was that it incorporated recent developments in architecture. In fact, these new extensions were built using vaults, arches and abutments to sustain the whole building and to allow the creation of windows to illuminate the different places, which embellished the abbey. In addition, these new architectural systems reduced the risk of collapse which was previously a frequent occurrence. Nowadays, Mont Saint-Michel is regarded as a Romanesque style church. In the early 13th century the King of France, Philippe Auguste (Philip Augustus), fought the powerful duchy of Normandy, in order to enlarge his own kingdom. In 1204 the Breton Guy de Thouars, allied to the King of France, undertook the siege of Mont Saint Michel but was obliged to beat a retreat under the powerful walls of the abbey. Unfortunately, the fire which he himself lit, extended to the buildings and damaged the Mount and its Abbey. Horrified, but also seeking the support of this spiritually powerful community, Philip Augustus offered Abbot Jourdain a grant for the construction of a new Gothic-style architectural set, later called “la Merveille” (the Marvel) which includes the addition of a cloister, a refectory, “la salle des Hôtes (Hosts’ room), “la salle des Chevaliers” (Knights’ room”) and major restoration of the conventional buildings. During the Hundred years’ war between the Plantagenets (English) and the Valois (French) between 1337 and 1453, the Mount became a real fortress. Towers and battlements were built all around the Mount, which added to the natural protection from the tides and the isolation. Also, the Abbey was altered, in particular its entry, where towers and successive courtyards were built to create a barbican. After the defeat of Azincourt in 1415, Normandy was conquered by the English and Duke Bedford, brother of King Henry V, ruled Normandy and gained the support of the Mount’s Abbot: Robert Jolivet. However, the monks refused to follow their Abbot and remained loyal to Dauphin Charles (future Charles VII). At the turn of the 15th century, things became critical for Mont Saint Michel: the English were determined to destroy the fortress which had resisted their assaults for so many years. In 1424, they started a siege, placing soldiers and a wooden fortress on the mainland while ships formed a maritime blockade. This was rapidly broken by a Breton maritime expedition which left from Saint-Malo and which enabled supplies to reach the Mount by sea. 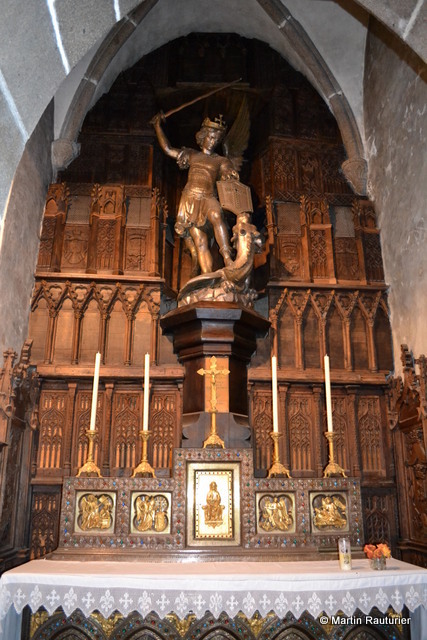 It is said that this victory was perceived as an intervention from Archangel Michael and is probably why we find references to St. Michael amongst those who talked to Jeanne d’Arc (Joan of Arc), guiding her through her epic journey through to the coronation of Charles VII in Reims. The new King of France began to reclaim his kingdom and appointed Louis d’Estouville, a brilliant captain in charge of Mont Saint Michel’s garrison. In 1434, in a last tentative effort, the English partially destroyed the battlements and lit a fire in the village; Taking advantage of the situation they used siege engines to open a breach in the wall which allowed the English soldiers to invade the streets of the Mount. However, the Mount’s garrison resisted and the English army was forced to retreat. 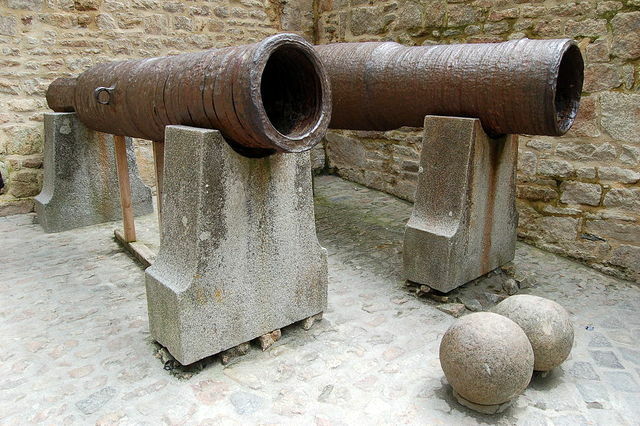 As a souvenir, the garrison kept two wrought-iron canons left by the English and placed them at the main entrance of the Mount. “Les Michelettes”, as they were named, are nowadays still displayed near the outer defensive wall. At the end of the Hundred years’ war the Romanesque choir gallery of the Abbey, which had collapsed in 1421, was finally replaced by a Gothic style one. 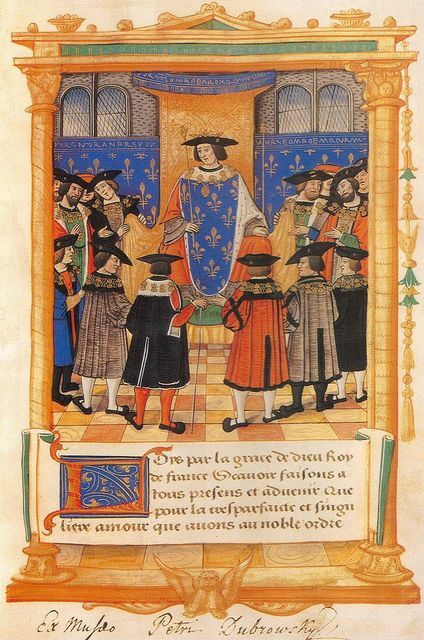 In 1469, at the end of the Middle Ages, King Louis XI, who visited the Mount twice to celebrate the victory over the English, decided to create a Knights Order: “Les chevaliers de Saint Michel” (The Knights of Saint Michael). The knights were chosen from the most important lords in the Kingdom and received a collar made of golden shells with a medal representing the Archangel defeating the dragon and also bearing the motto of the Order: “Immensi terror oceani”, Latin for “Terror of the immense oceans”. 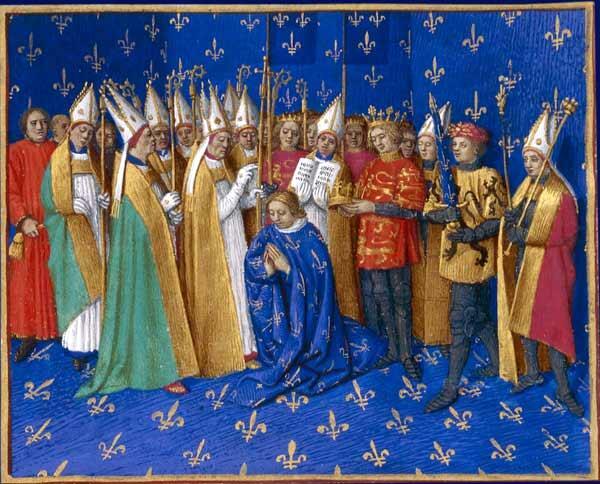 Knights played the role of advisors and gathered around the King during official ceremonies and sumptuous masses in Saint Michael’s chapel, on the “Ile de la Cité” in Paris. Over time, the Mount became deserted: it did not escape the fighting between Catholics and Protestants when the Protestants tried several times to conquer the Catholic Mount. Monks and Abbots started to desert the Mount whose buildings were close to collapse. Meanwhile, the monarchy started to use the Mount as a prison for political opponents that they did not want to kill, fearing a bad reaction from the people. 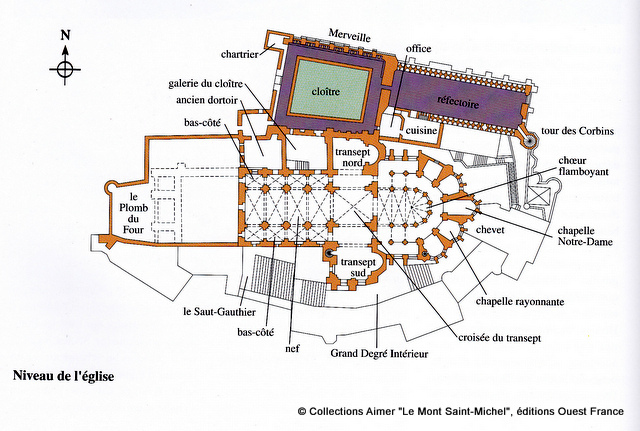 As proper jails did not exist, the monarchy started to use fortresses such as the “Bastille” in Paris and the fortified Abbey of Mont Saint-Michel where prisoners, often without trial, were kept by the monks. Less obedient prisoners were kept in an iron cage devised by King Louis XI which hung from the ceiling and was completely soundproof, thus cutting the prisoner off from the rest of the world. Even though it still welcomed some visitors, the Mount barely attracted any monks and the Abbey was officially closed when the Revolution started and became a prison for opponents. In the 19th century, writers of the French Romantic movement such as Victor Hugo launched a campaign to restore the Mount which was seen as a national architectural treasure. The prison was finally closed in 1863, during the Second Empire and in 1874 the Mount became an “historical monument” and has since been protected and maintained by the “Service des monuments historiques” (Historical Monuments Office). 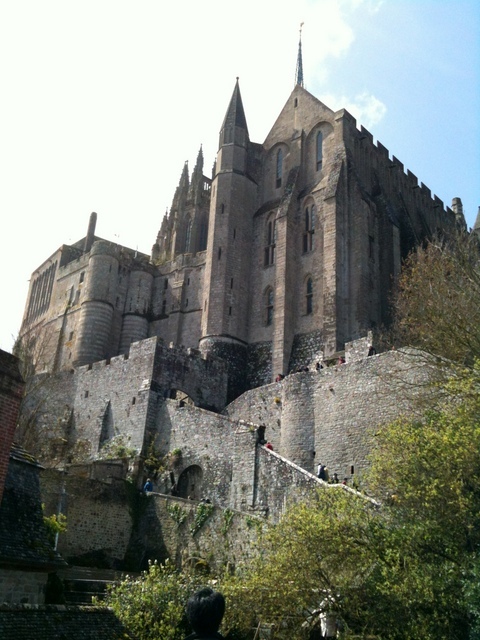 More recently, in 1966, as a consequence of the celebration of the monastic millennium, a community of Benedictine monks settled in the Abbey and then, in 2001, the Archbishop of Coutances and Avranches asked the Monastic Fraternities from Jerusalem to settle at Mont Saint-Michel in order to welcome pilgrims and pray for and with the visitors to the Mount. The brothers and sisters of the monastic Fraternities from Jerusalem are still in residence today and visitors can attend a public mass in their company. Mont Saint-Michel as we know it nowadays would not be complete without its village and its main street full of souvenir shops, bistros and other boutiques. In fact, at the same time as the Abbey was developing, the village below was becoming more and more important, in particular because of the many pilgrims who came to the Mount which was as famous as Rome in Italy, or Santiago de Compostela in Spain. These pilgrims needed a place to sleep, to eat and whilst the less fortunate were welcomed in the Abbey’s chaplaincy, the more wealthy were able to afford a night or a meal in an Hotel. Also, they were all looking to bring back a souvenir from their trip and many boutiques, called “enseignes de pélerinage” offered shells or medals with St. Michael’s face, etc… Therefore, pilgrimage after pilgrimage, the small village grew and became what it is nowadays, which is well illustrated by the main street of the village, full of boutiques selling all kinds of souvenirs and tourist paraphernalia. 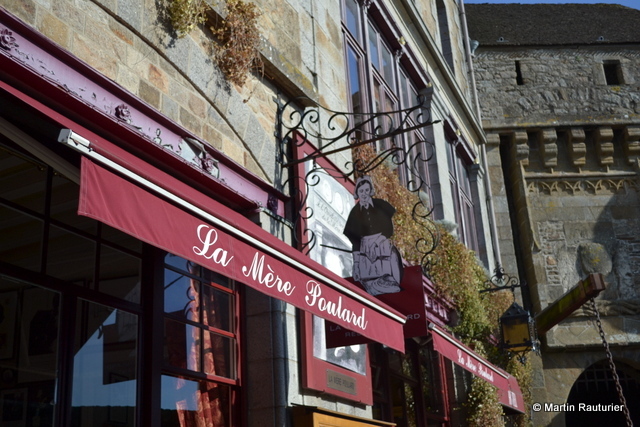 One of the main symbols of the village is the hotel-restaurant of the “Mère Poulard”, famous for its omelette. The “Mère Poulard, named after Anne Poulard (née Boutiaut), a famous French cook and owner of an hotel on the Mount, where people could enjoy a wonderful omelette as well as the kindness of their host. Anne Poulard lived with her husband on the Mount until her death in 1931. They are both buried in the Mount’s cemetery but their hotel/restaurant remains famous and you can still enjoy a tasty omelette at “La Mère Poulard” or watch cooks preparing it in traditional costumes. Built from the 10th century, the Abbey is composed of many architectural buildings in multiple styles, illustrating the evolution of the Mount throughout the ages. 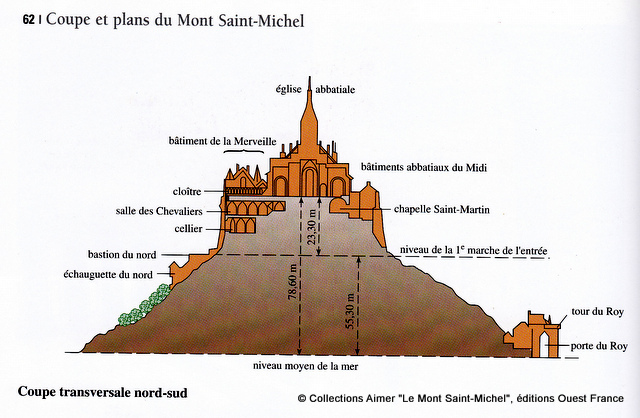 In that sense, Mont Saint Michel could be considered as a megastructure, where buildings are on top of each other. The steeple: The steeple has been struck by lightning several times, often burning the wooden structure. During the Gothic era, the pointer was flanked by six pyramidal summits. Later, a platform was built for Chappe’s telegraph. The architect Petitgrand erected the current steeple composed of two Romanesque style floors and crowned with a gothic style pointer, similar to the one at the top of Notre-Dame in Paris. The steeple of the Abbey also has a golden statue of St. Michael brandishing a spear and flooring the devilish dragon. The classic front of the Abbey: Between the 16th and 19th centuries the buildings suffered from a lack of maintenance and many collapsed. Two towers used to sit on top of the main entrance, but one disappeared at the end of the Middle-Ages and the other after the fire in 1776. The authority then decided to demolish the three western spans of the nave and build a platform or terrace called “le Plomb du four” as well as rebuilding the front in a classical style. The nave: The nave, constructed in 1084, was originally composed of seven spans. It illustrates the apogee of Norman architecture. The ceiling of the nave is a wooden structure as stone vaults were only used for “holy” places such as the choir. Some historians even think that the ceiling used to be flat and that the wooden vault would have been built during the 15th century. The nave reveals the progress of architecture and the achievement of having built such a stunning building on a tiny rocky island. The entire Abbey is secured thanks to a frame of columns and arcs. Nonetheless, this was not achieved without catastrophe: in 1103, the northern wall of the nave collapsed onto the convent buildings where monks were praying. That is the reason why the southern and northern parts are different. The southern parts date from the 11th century and the northern parts from the 12th. Each span is divided into three floors: the arcades with the stands on top and high windows which let the light in. The flamboyant choir: As the Romanesque choir collapsed during the Hundred Years War in the 15th century, it was rebuilt between 1450 and 1521. However, the architectural style at that time was different and methods had changed. Therefore, architects started first by building 10 polygonal pillars to sustain ribs and arcs. Also an ambulatory, composed of many chapels, runs all around the choir, which itself is inspired from Saint-Ouen’s nave in Rouen. There is a gap of four centuries between the Romanesque nave and the choir! Architects decided to rebuild the choir in a vertical manner which is why the pillars are less thick and the spans narrower, giving the impression of an element soaring up to the sky. 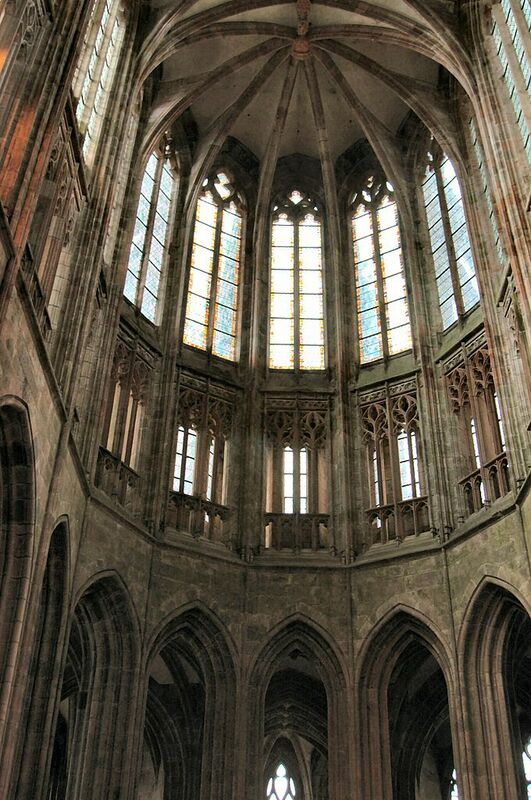 Each span is also composed of three floors: the arcades, the triforium or stands and high windows. The triforium is a great example of the flamboyant gothic style as it allows the exterior light to come in, through the clearstory lined with a nice lace-like sculpted balustrade. The Chevet: As the new choir, with its high vaults, was opening towards the exterior, architects had to build abutments in order to consolidate the whole Abbey. These buttresses are made of columns linked by a wall. They rest upon separate walls of the chapels which are all around the ambulatory surrounding the choir. Pinnacles were built on the top of the abutments and were decorated with stone flowers, showing the typical architecture of this era. The Abbey as we know it nowadays actually rests upon multiple crypts which are either the remains of ancient buildings or specially built in order to support the extensions of the Abbey. These crypts were also created as different places of worship. “Notre-Dame des trente-cierges” (Notre Dame of the thirty altar candles): This crypt supports the Abbey on the Northern part of the transept. It was the spiritual heart of the Abbey where monks used to keep clothes from the Virgin Mary. Its vestibule was used as a prison and was called the “cachot du diable” (Devil’s dungeon). “Le promenoir des moines” (the monks’ covered walk) was built during the 12th century illustrates the shift from Romanesque architectural style to the Gothic one. Indeed, Abbot Roger II decided to build groin vaults but after a fire in 1138, Bernard du Bec decided to change them to rib vaults which gave them greater breadth as well as more solidity. Historians do not really understand the way this room was used. They assume, as its name suggests, that it was a place where monks used to come to relax and walk. 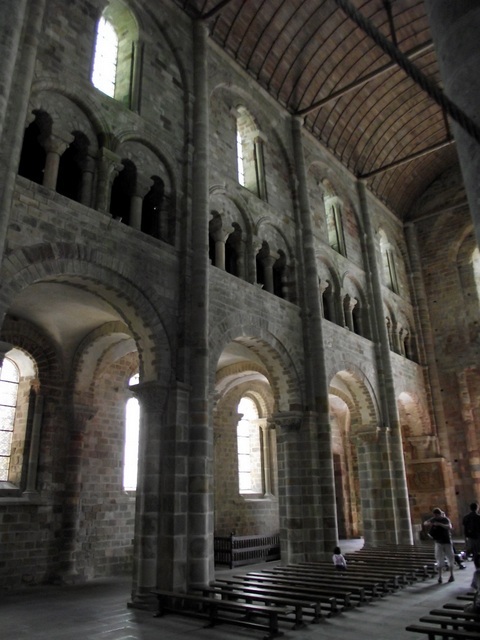 L’Aquilon (12th century) whose name comes from a cold wind, was the Romanesque chaplaincy, located north, close to the former entrance of the Romanesque Abbey. 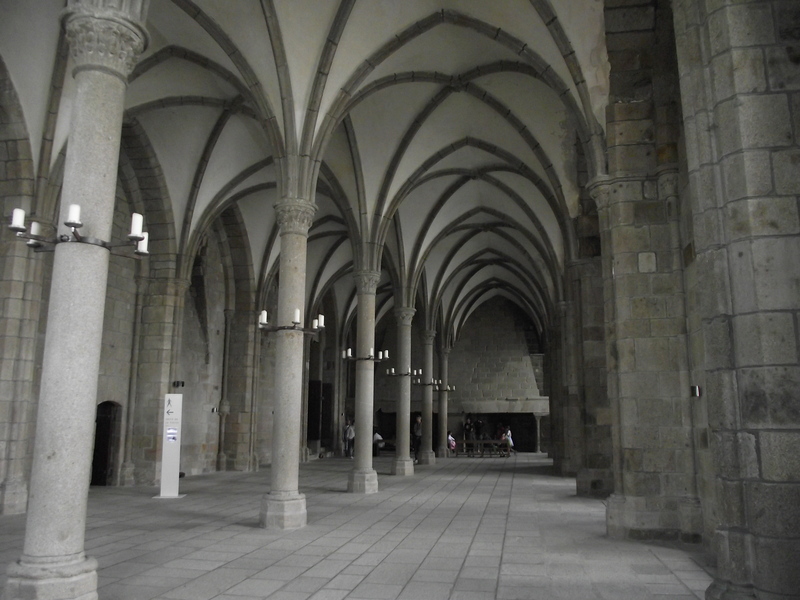 Monks probably welcomed pilgrims into the room of the Aquilon, built with groin vaults. Notre-Dame-sous-Terre (Notre Dame underground) is the first church built by Abbot Aubert in the mid 10th century. It has two parallel naves separated by a wall, itself interspersed with two arcades. This church was originally in the open air but became a crypt when the Romanesque nave was erected. “La roué, le poulain (19th century) et l’ossuaire roman” (The wheel, the foal and the Romanesque ossuary). The Abbey spreads to the south with buildings allocated to the pilgrims but the three floors collapsed in 1817 and the infirmary disappeared. It used to open onto Saint-Etienne chapel, ‘the chapel of the dead’, as the monks’ graveyard was adjacent. During the time the Mount was a prison, the authorities installed a wheel in this ossuary with which prisoners, walking inside the wheel, powered a kind of mine cart along a “poulain”, a stone ladder inclined along the rock. 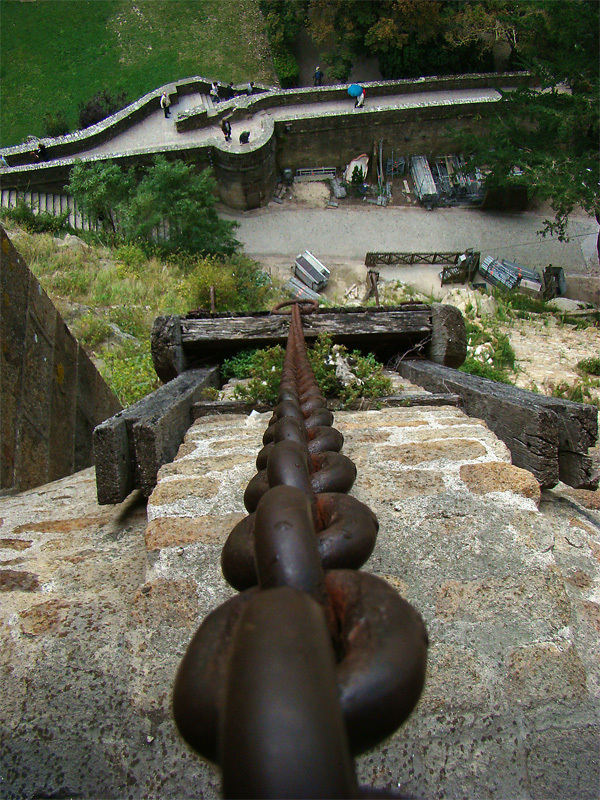 This mechanism is a legacy from the Middle-Ages and can still be seen nowadays. “Saint-Martin chapel” sustains the southern part of the Abbey’s transept. It is a very austere style crypt which offered a majestic atmosphere for funeral rites which were another important activity in the Abbey as many lords wanted to be buried in the sanctuary of St. Michael. 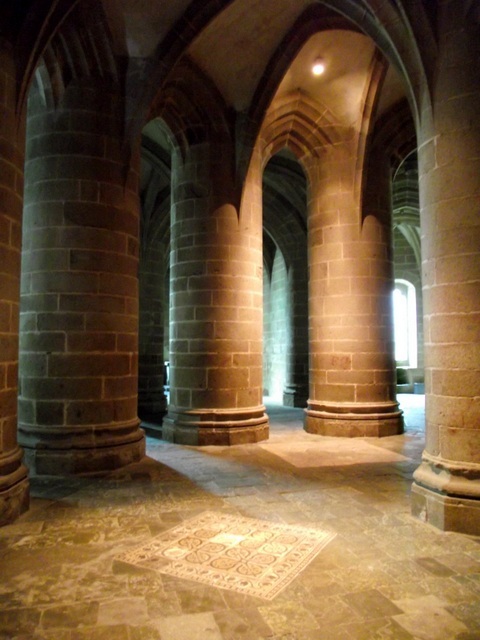 “La crypte des Gros Piliers” (the “big pillars’ crypt”). This crypt was built only as a base for the new choir. 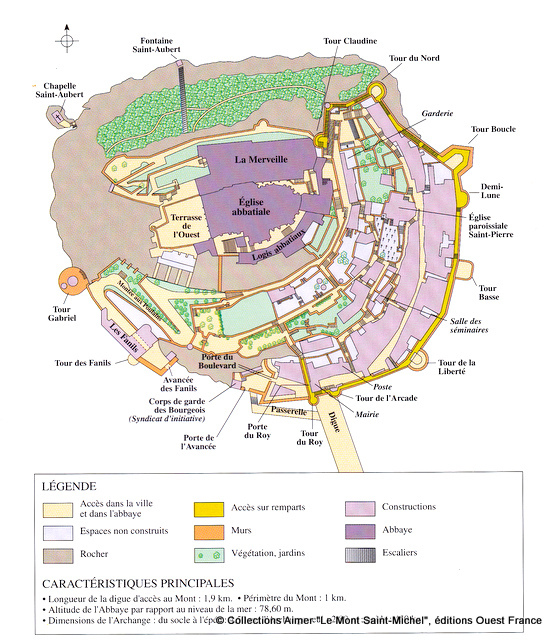 After the Hundred Years War, works began and the crypt was finished within a few years. Ten cylindrical pillars, whose centre might be the former Romanesque column, were built to support the new Gothic flamboyant style choir. On the ground floor: the western cellar and the eastern cellar where the poor used to get their food. 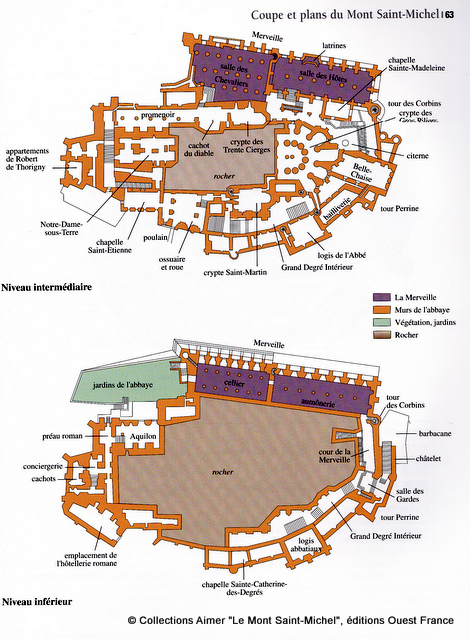 On the intermediate level, the “salle des Chevaliers” (Knight’s room) and the “salle des Hôtes” (Hosts’ room) where the Abbot used to receive the different lords and Kings. 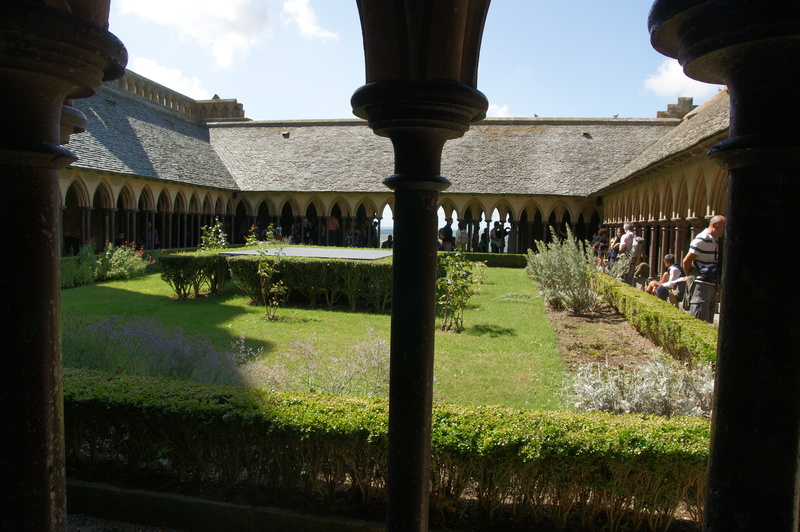 Finally, on the top floor, the cloister and the “Réfectoire” (refectory), used by the monks. This hierarchy was also shown when the Abbot received guests: the King was welcomed at the feet of the Mount, at the main entrance, whereas the Bishop was welcomed at the entrance of the Abbey. At the North-west angle of the “Merveille”, the least accessible part of the Mount, are located the archives of the Abbey and its monastery. The “Merveille” also contributes to the reinforcement of the defensive character of the Mount, protecting the Northern flank of the Abbey. “Le cloître” (The Cloister). Contrary to tradition, this cloister was not built at the centre of the monastery and thus does not link with all the other buildings. Nonetheless, as in every monastery, it is a place of contemplation, of promenade uniquely for the monks. It also used to serve as an open air library as monks were usually copying books or simply reading. The cloister has a beautiful garden encircled by covered galleries, to allow the monks to walk and stay there while it is raining. In order to build this space, the northern part of the Abbey’s transept had to be partially reduced. The western, gallery was supposed open onto another building, mentioned before, and the three bay windows would have been the doors. 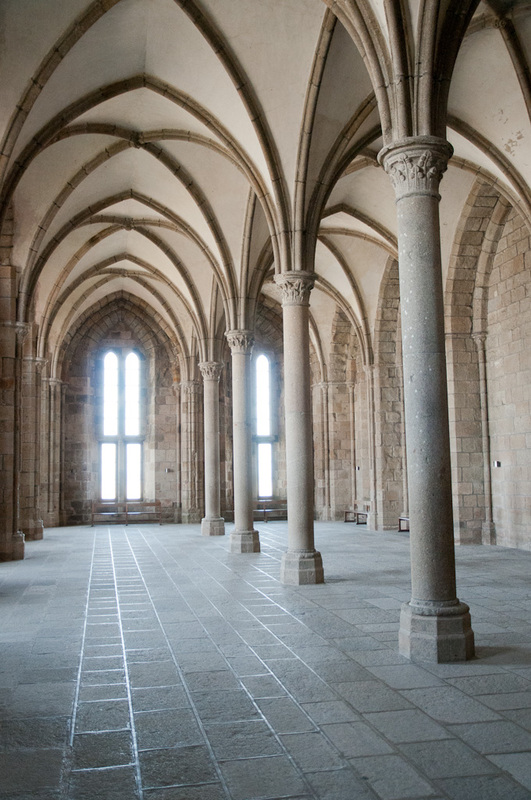 The cloister was built as the expression of God in a human form. In fact, the cloister embodies the link between the people and God, the land and the sea, the ground and the sky and its granite columns were sculpted to match the average size of a man. Also, the distance between two pillars is exactly the same as the average width of a man. “Le réfectoire” (the refectory). Mealtime is a very important part of monastery life which explains why the refectory was built so carefully. Considering the size and the fact that the refectory was on the top of other buildings, a vault would have been too heavy and architects chose instead a large central frame, reminiscent of the nave. Another feature of the refectory is that it is really bright even though no windows are visible when you enter the room. 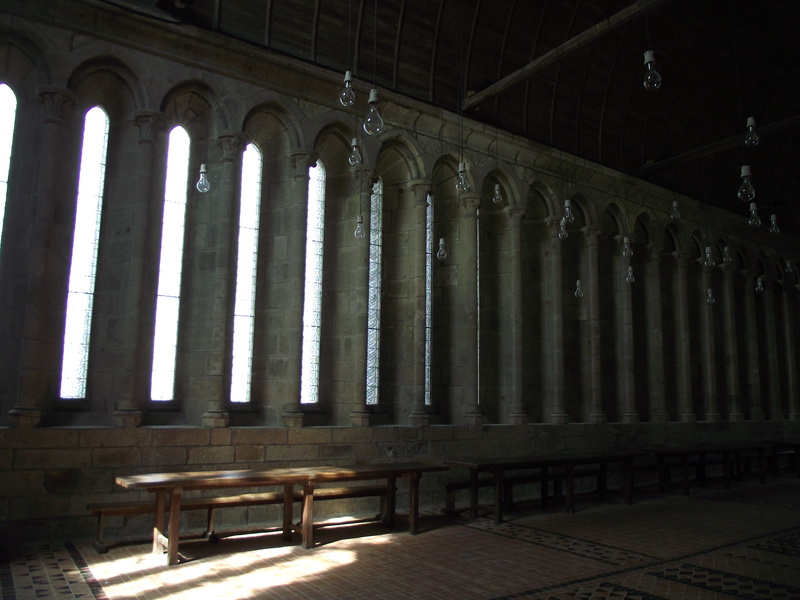 In fact, there are windows but thanks to its design, they are not visible when you are not facing them, probably because the monks did not want the refectory to be too luxurious and wanted to keep this image of austerity. “La salle des Hôtes” (Hosts’ room). It is in this room where the Abbot received very important visitors. They are two naves were tables were displayed, two big fireplaces where the food was cooked and latrines on the northern wall. Germain Bazin described this room as one of the most beautiful creations of civilian architecture during the Middle-Age. Indeed, if you imagine this room as it was back in the time, with its paintings, sculptures, tapestries, tiles, added to the natural beauty of the columns and rib vaults, it must have been stunning. Adjacent to the southern wall, St. Madeleine chapel allowed travellers to pray before and after their meal. “La salle des Chevaliers” (the Knight’s room). This room earned its name from the St. Michael Knights’ Order, founded by King Louis XI. However, it seems that no assemblies were held in this room. It was used more by the monks as another room for meditation. In fact, historians think that tapestries separated this big room into smaller areas, allowing the monks to pray quietly. 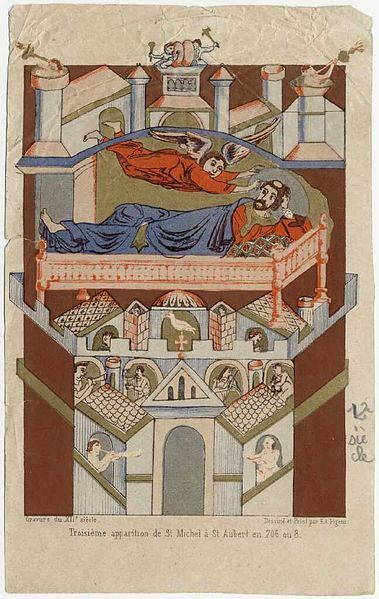 Some tapestries would also have separated the southern passage allowing hosts to go to the church without disturbing monks who were occupied in copying and illustrating manuscripts. From the eastern side and all the way to the south-west, we find the dwelling of the Abbot who, unlike the monks, lived “within” the population. The building actually faces the village and the mainland. It does not have a very specific style and even though it is a civilian building, its architecture reflects a military character. Above the guards’ room, is located the “Belle-Chaise” (nice chair) which was actually the tribunal directed by the Abbot who was seated on a chair, giving its name to this room. Since its creation Mont Saint Michel has been seen as a strategic place, first in the war between Bretons and Normans and then between the French Kingdom and the English during the Hundred Years War. Many battlements and fortifications date back from this period (15th to 17th century) and with the development of arms and especially the use of cannons, defenders had to adapt their strategies and defences. On the Mount, many battlements date back from the Hundred Years War and a few which were added in the late 16th century. The entrance to the Mount was defended by three successive doors: the “Porte de l’Avancée” (the Advance Gate), built in the 16th century; the “Porte du Boulevard” (Boulevard Gate), built during the 15th century; and the “Porte du Roi” (King’s Gate) itself protected with a ditch, a drawbridge and a portcullis and two towers: the “Tour du Roi” (King’s Tower) and the “Tour de l’arcade” (Arcade Tower) also defended the causeway. In addition, soldiers patrolled the rampart walk. Nowadays everything is still visible and you will also see the two canons, called “les Michelettes”, left by the English, in the courtyard between the first and the second doors. The battlements run from the entrance to the northern corner, at the foot of the “Merveille”, with the “Tour Claudine”. In between, there are high towers reinforced by a thick rampart wall. These ramparts, built in the 15th century, were not simply a link between the towers but were built as part of the defence of Mont Saint-Michel. Towers do not dominate the rampart anymore but they are defended by these walls. This was due to a new military theory described by Germain Bazin who said that what defends must be defended. Even though the majority of the towers are round, the “Tour Boucle” (the loop tower) was a sign of the upcoming Vauban fortifications. Indeed, this tower, defending the eastern part of the Mount, juts out, protecting its neighbouring towers and is a polygonal shape which allowed the soldiers to have better visibility and they were thus able to shoot in every direction. In 1524, on the western side, the lieutenant of the King, Gabriel Dupuy completed the defensive structure with a final tower, called “Tour Gabriel” (Gabriel Tower), which has a round shape and allowed soldiers to react rapidly, shooting in every directions from three levels which were built to house cannons. The main purpose of this tower was to protect the “Entrepôt des Fanils” which was used as a warehouse. In the 17th century, a windmill was built on the platform of the tower which became a semaphore at the end of the 19th century but as the Couesnon River was not navigable, it was useless and abandoned. Last but not least, the Abbey played an important role in the whole fortification system. Even though the Mount was, with its naturally austere character, almost impossible to attack, men from all ages tried to improve the defences and protect the monastery. First of all, the “Châtelet”, was built after the barbican, thought to repel the enemy in an open air area where they would be vulnerable. Two towers flank the “Châtelet” which embody the entrance of the Abbey which was previously located on the northwest side of the Abbey. On the right, is the guards’ room, protected by a portcullis. Besides, the “Grand Degré Intérieur”, a narrow path alongside the convent buildings leading to the sanctuary, was also a military type construction. In fact, monks and soldiers could easily defend this path, as it was narrow and overlooked by two great fortified bridges, linking the convent buildings and the deep rooms of the Abbey. Since the time when these fortifications were built, between the 14th and the 16th centuries, the Mount started to be called a citadel having regard to its defensive character. 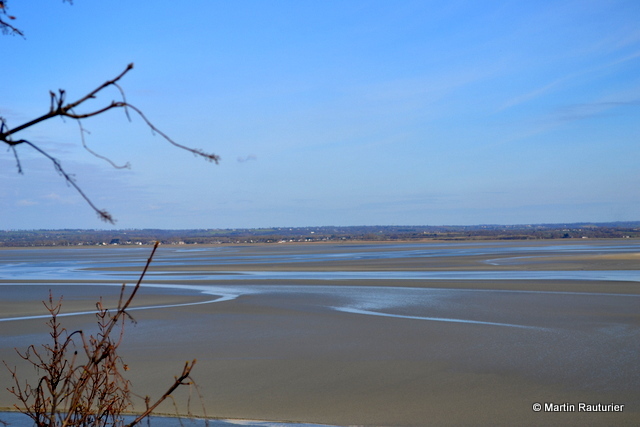 The bay of Mont Saint-Michel has been protected by the Ramsar Convention, or Convention on Wetlands, since 1994. The bay benefits as well from the ‘Special Protection Area’ label, protecting birds. Amongst the species that can be seen around the bay, there are seals, dolphins, many types of fish and above all, crustaceans. In terms of birds, there are various species and some, such as the Great Cormorant or the Razorbill, are famous. However, considering the constant flow of the sea because of the tides, the mainland has become a vast salt marsh where we find some “Argousier” (Hippophae rhamnoides) or the famous Salicornia that can be eaten as soon as it is collected. One of the most famous dishes of the region is the “agneau de pré-salé” obtained thanks to the salt naturally present in the fields around the bay where lambs and sheep spend their time and feed on this naturally salted grass which results in a salty meat. Tourists can also enjoy different walks around the bay during low tide. Many guides and associations have developed partnerships with Mont Saint-Michel’s tourist office. Walking around the Mount in the bay is very interesting as it offers different perspectives and vantage points. It is also a good opportunity to discover and observe natural species in their living environment. However, it has to be undertaken with a certified guide because the bay also has some dangers such as quicksand and imprudent visitors can be surprised by the quickness of the tide. 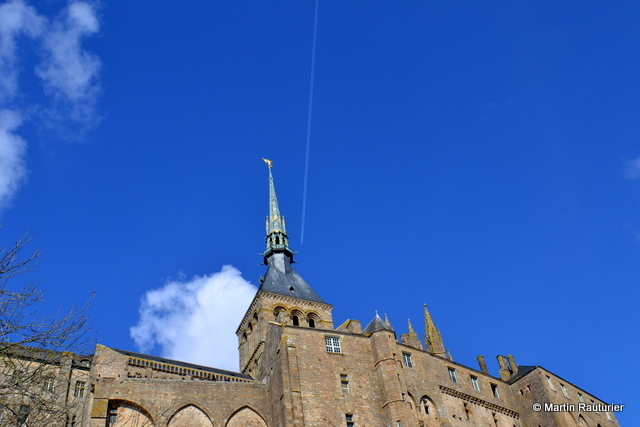 The Mount is located right on the border between Normandy and Brittany, two culturally rich regions which gives the visitor many opportunities to experience French culture, after having visited the Mount. An hour away from Mont Saint-Michel, you can discover the beautiful northern coast of Brittany, starting with the city of Saint Malo another fortified town whose harbour hosts regular trips between France and England (Portsmouth). On the other side, Mont Saint Michel is located only one and a half hour away from Caen and the beaches where the Allies’ landing took place in June 1944. The “Memorial de Caen”, telling the story of the Second World War, with unique documents, is worth a visit. It is also very impressive to walk around the different beaches, from Utah to Sword, passing by Omaha, with its American graveyard and the remains of German bunkers and the little village of Arromanches where you can still see some elements of the artificial harbour which permitted the Allies to disembark soldiers and materials. Not far from here, Bayeux where the Tapestry which was named after the city, is displayed. This 70 metre long, extremely detailed tapestry is a precious item of heritage which tells us the story of the conquest of England by William, Duke of Normandy. A fun fact, Mont Saint Michel is depicted in the tapestry when William and his army embark for England. 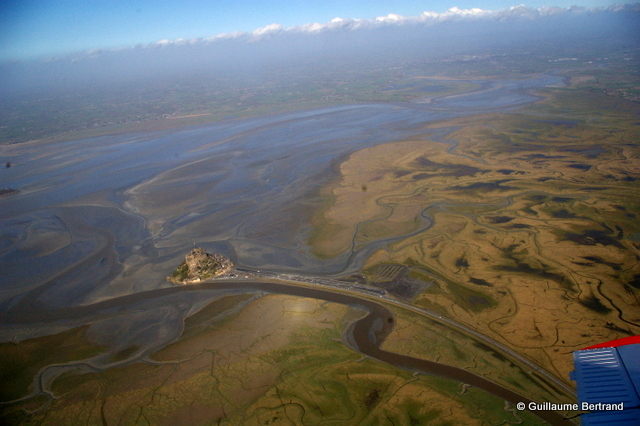 In the late 20th century, concern that Mont Saint-Michel would one day no longer be an island, emerged. For ages, due to human intervention such as land reclamation, creation of the causeway, construction of the dam with flood tide gates and so on, the land has been gaining over the sea. Because of the dam, the Couesnon River is no longer able to perform its role of pushing back sediments into the sea and sediment has built up more and more around the Mount. 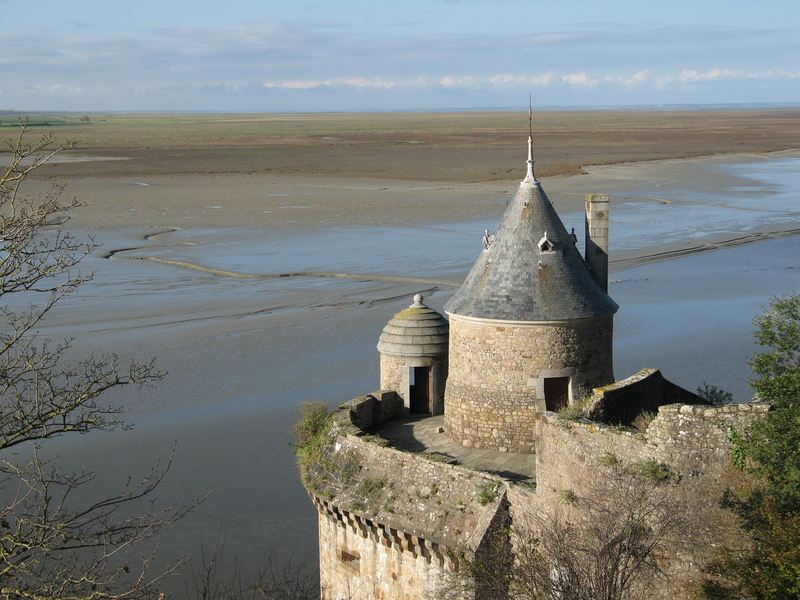 According to scientists, if nothing is done, by 2040 sand will build up all around Mont-Saint-Michel. This will destroy its character, the main reason why Aubert and men after him built the Abbey and developed the Mount. Therefore, during the seventies, the authorities tried to get rid of the sediment but it appeared to be impossible. In 1995, studies were launched and works began in 2005 and finished in 2015. This project was worth 200 million Euros and is financed by the EDRF (European Regional Development Fund), the State of France and different participants from both region Normandy and Brittany. In order to achieve the full recovery of the maritime character of the Mount, a dam was built on the Couesnon River and has been operating since 2009, helping the natural flow of the River to eliminate sediments off the bay when the tide is low, by flushing a quantity of water accumulated with the high tide. 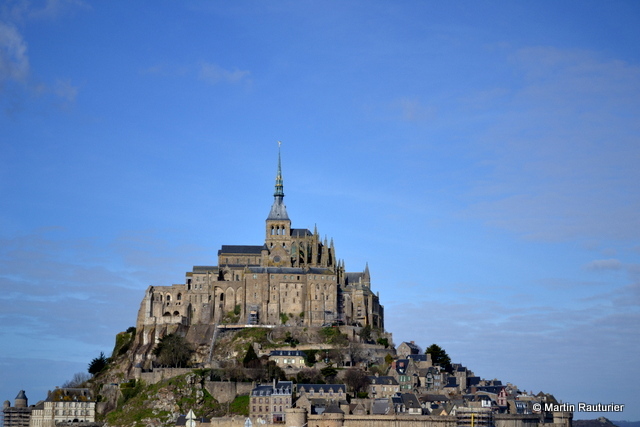 According to the project’s estimations, Mont Saint-Michel should recover its maritime character by 2025. Results have already been measured by scientists. As a consequence, the current car parks, located at the foot of the Mount, were removed and a new causeway was built, slightly more east than the previous one which dates back from the end of the 19th century! This new causeway was built high enough and set on pillars in order not to disturb the tidal movements and waves. In addition, new car parks were opened on the grass 2.5km away from the Mount. Access works are now completed and visitors access Mont Saint-Michel walking or via shuttles, starting from the dam and arriving on a platform approximately 100 metres away from the Mount. Visitors continue on a submersible ford to reach the “Porte de l’Avancée”, the main entrance to the Mount. This ford is covered by the tide for a few hours every year during exceptional tidal coefficients above 110. However, the works encountered some difficulties. The main one is that car parks was removed and installed on the mainland but the shuttle system, which carries people to the Mount, via the current (old) causeway, is said to be not really efficient. In fact, the “Centre des Monuments Nationaux” (National Heritage Fund), which only rules the Abbey, observed a 24% decrease in visitors between July 2011 and July 2012. This has been attributed to the lack of efficiency of the shuttle system and the higher price for the car park. However, it is important to take into account the weather which was not kind that year and also the fact that the shuttle system was only launched in April 2012. Nonetheless, for the year 2013, the “CMN” claimed more information and visibility for the visitors. Another debate is about the submersible ford: organisations for the preservation of historical monuments as well as the culture ministry wanted the earth platform to be 6.30 metres high but the Prime Minister’s office officially and repeatedly asked for the platform to be 7.30 high to enable permanent emergency access. The problem is that with a platform of 7.30 metres, it would be necessary to disturb the rock which is classified as an historical monument. As it will be difficult for the organisations to defend their point of view against the government’s official decisions, they have decided to appeal to the UNESCO. It is always difficult in this kind of project to find the right balance but it even harder when it concerns a place which is often described as the “eighth wonder of the world”. 3.30 hours from Paris via the A13 to Caen and then the A84 in the direction of Rennes. 1 hour from Rennes via the A84 in the direction of Caen. 1.20 hour from Caen via the A84 in the direction of Rennes. You can fly from Paris to Rennes which is the closest city to Mont Saint-Michel, with an airport located 75 kilometres away from the Mount. 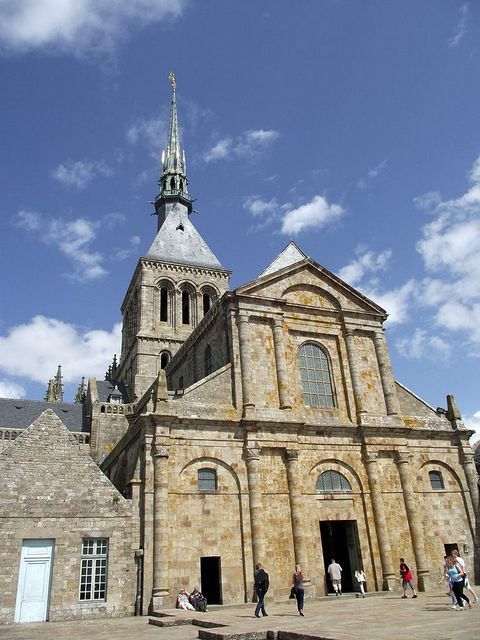 Click here to get your entrance ticket to the Abbey of Mont-Saint-Michel! 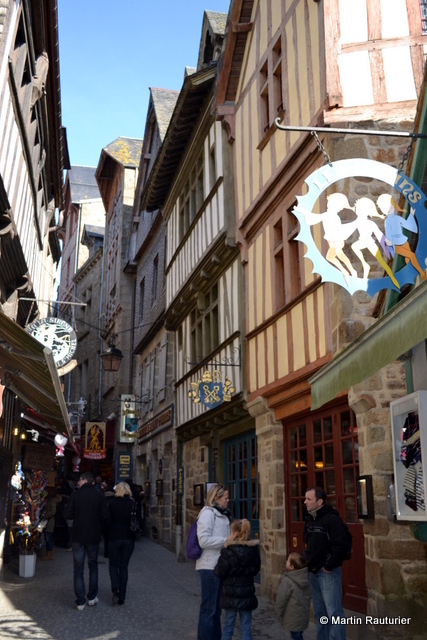 To get more information about the Mount, visit the Tourist Board of Mont Saint-Michel. Next Article Our first-ever Youtube video!